This is also the bridge from yesterday's photo. Ah, I thought yesterday you were higher up! Whew. You're safe. Happy New Year. Petrea: No, no. I like staying close to the ground. Even up in the mountains. is this a new foot bridge? 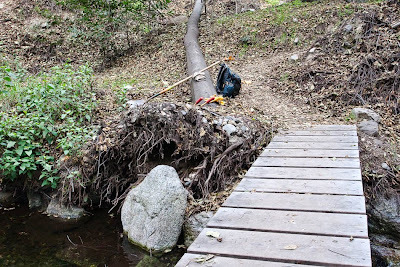 I wish they would come up with something of that nature over at Eaton Canyon. Something down by the Nature Center. Pas Adj: I'm not sure exactly when it was built. I would guess a couple of years ago. That makes it fairly new.